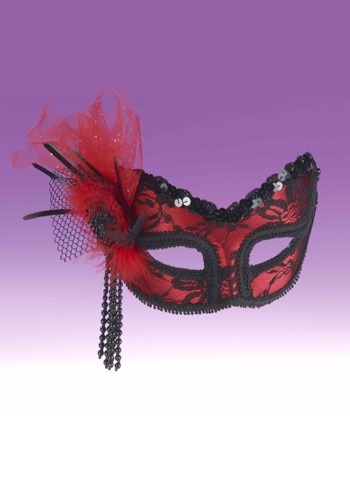 Black lace overlay covering a red satin mask. What is it about half masks that can turn a normal party into a gala? Maybe we've read a one too many Harlequin Romances, but think about it! The masquerade ball practically made Romeo & Juliet. Would they have fallen in love if they hadn't been swept up in the intrigue and exciting of a bunch of half-masked people dancing around? Maybe! But we'll never know, will we, because that play is at least 500 years old and Shakespeare is now writing sonnets in the big playhouse in the sky! And what was one of the most mesmerizing scenes in the movie Labyrinth? When they were at the masquerade ball, right? (Admittedly the whole thing was also a little creepy, but let's not quibble facts right now...we're on a roll!). And don't forget how great these masks are for covering up disfiguring scars or hideous face syndrome, as proved by both The Phantom of The Opera and The Man In The Iron Mask. With these gorgeous and decorative accessories, you'll never have to worry about hearing the terrified shrieks of men, women, or children whence they come upon the sight of you! Basically, "What a lovely mask, I hardly noticed your face!" or "I have no idea who you are or might be, let's dance!" are the only comments you'll hear when you're wearing this Red Black Lace Half Mask! And frankly, with it's decorative sequins, beads, and feathers, this mask deserves all the veiled (get it?) compliments it can get!